This set of Molecular Biology Questions and Answers for Experienced people focuses on “DNA Topology – 2”. 1. How is the extent of supercoiling measured? Explanation: The extent of supercoiling is measured by the difference between Lk and Lk0. This is known as the linking difference and is expressed as ΔLk = Lk – Lk0. Explanation: If ΔLk of a cccDNA is significantly different from zero, then the DNA is torsionally strained and hence it is supercoiled. If LK < ΔLk and ΔLk < 0, then DNA is said to be negatively supercoiled. 3. What is ΔLk and Lk0 dependent upon? Explanation: ΔLk and Lk0 are dependent upon the length of the DNA molecule thus it is more convenient to refer to a normalized measure of supercoiling. This is known as the superhelical density and is assigned the symbol σ. 4. Strand separation is easily accomplished in positively supercoiled DNA. Explanation: Regions of negatively supercoiled DNA has a tendency to partially unwind. Thus strand separation can be accomplished more easily in negatively supercoiled DNA than in relaxed DNA. 5. Which of the following organism have been found to have a positively supercoiled DNA? Explanation: The only organisms that are found to have positively supercoiled DNA are certain thermophiles, microorganisms living under conditions of extremely high temperature. Example of one such bacteria found in hot springs are Thermus aquaticus. 6. Which of the following is not true about positive supercoils? Explanation: The positive supercoils are thought to store free energy that helps keep the DNA from denaturing at levels of elevated temperature. Positive supercoils can be converted into more twists and thus requires a very high amount of energy to separate its DNA strands than any other type of negatively supercoiled DNA. Explanation: In the nucleosomes the double helix is wrapped almost two times around the outside circumference of a protein core. This wrap is recognized as a toroid or spiral form of writhe. 8. The nucleosome is seen to have negative supercoils. Explanation: The spiral writhe found in the nucleosome is seen to have a left – handed spiral that is equivalent to negative supercoils. Thus, the packaging of DNA into nucleosomes introduces negative superhelical density. 9. Which of the following is known to relax supercoiled DNA? Explanation: The linking number is an invariant property of DNA that is topologically constrained. It can only be changed by introducing interruptions into the sugar – phosphate backbone. Topoisomerases are able to do the same by introducing transient single or double stranded breaks. 10. With respect to topoisomerases which of the following is true? Explanation: Topoisomerases are of two general types. Type II topoisomerase changes the linking number in two steps. They make transient double stranded breaks in the DNA through which they pass a segment of uncut duplex DNA before resealing the break. They require ATP hydrolysis for this action. 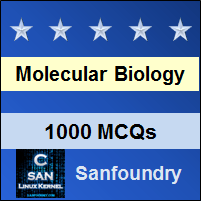 To practice all areas of Molecular Biology for Experienced people, here is complete set of 1000+ Multiple Choice Questions and Answers.